With Provare’s full service hosting, you never have to worry about ops again. We ensure that your application serves your customers 24/7 at the level of performance that you expect and we help you measure it against your business goals. You are free to focus your time and energy on innovation and on growing your market share. We can deploy on any infrastructure, including yours if you like. We already have on–premise deployments, as well as those on AWS, Azure, Google Cloud, Softlayer, Rackspace, Heroku, and Akamai. We can also host on bare metal in datacenters around the globe. We put your system where your customers are for far less investment than any one-size-fits-all provider. Provare’s Business Service Level Agreement (“BSLA”) transcends a traditional SLA. Traditional SLA’s guarantee uptime. Even with an elastic runtime, you are 100% responsible for testing and optimizing your code. And when your resource requirements grow, so does your bill. Our Business Level Service Agreement guarantees not only uptime, but user capacity, data and feature availability, and feature performance. We test your application and help you optimize it. With Provare, your site will be just as responsive for the 10,000th user as it was for the first. And you’ll never have to spend your creative energy on CPUs, memory, caching, load balancing, bandwidth, disk I/O or replication because we’ll handle all of that. Provaré starts by understanding your application, your customer demographic, and your goals so that we can recommend the best infrastructure solution. We containerize your application to make it as portable and easy to test & maintain as possible. We run a capacity and performance test and eliminate any bottlenecks we find, ensuring that we get every ounce of efficiency possible. We monitor your system 24/7. If there is ever a problem, we’ll likely see it before you do – and more importantly, before your customers start lighting up your phone lines. We are successful when your customers are happy and your business is growing. Once we onboard you and run our capacity and performance tests, we’ll offer you a fixed monthly price for the entire hosting, ops, and support package. You won’t find this kind of value and flexibility anywhere else. Off-the-shelf Plaform as a Service (“PaaS”) can be great when you’re just starting out, assuming you can find one suited to your needs. But as with any off-the-shelf solution, your product is limited at least to some extent by the platform you choose. Wouldn’t it be nice if you could have all of the convenience of PaaS with the tools of your choosing? You can. Provare can tailor a cloud-based development environment precisely to your needs. We have an extensive menu of options to enable your developers to shine. So whatever your language or development environment, whatever your favorite tools, wherever and whenever your team works, and however rigorous your process, we can not only accommodate you, but energize your team. Just as with PaaS, you get your own development environment with individual sandboxes for development and QA. Then when you release, your new version goes to your pre-production server, where we re-run our capacity and performance tests, again eliminating bottlenecks and optimizing as necessary before deployment into production. 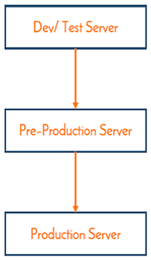 With our custom PaaS comes the additional option of contiunuous integration and delivery. You choose your CI/CD tools and we include them in your custom development environment, collaborating with you to configure them to maximize your team productivity and ensure that your developers get the immediate feedback they need to keep them out of trouble and moving forward. We’ll help you choose the best test automation frameworks for your platform. For some teams, xUnit tests and test-driven development are a good place to start. For others, we set up automated API tests. For still others, we ensure complete coverage from cross-platform UI to database performance. Since we’re tool-agnostic and know them all, we can work with you to help you pick the best solution for you. Until you’ve experienced the relaxed confidence that comes with developing in an optimally customized CI/CD environment, you simply can’t imagine it. Let us show you what we mean.